Welcome To Flavor Country, RCRG! The Rat City Roller Girls, Seattle’s renowned battalion of roller derby warriors, will make the trip over the briny deep this month to engage in a double-header with Kitsap’s own Slaughter County Roller Vixens. It’s the last extravaganza of the Roller Vixens’ first season, and the women wouldn’t hold it against you if you showed up and cheered them on as they take on the Masked Yuppies of Seattle! And when the blood spills, it will spill on Bremerton soil! Bwah-hah-hah! But that’s not all! 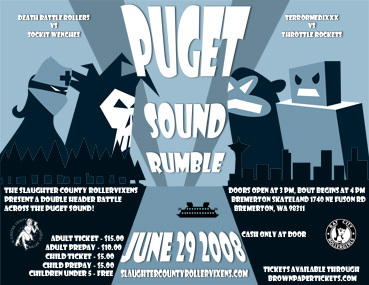 Ticket holders will also be treated to a thrilling bout involving fully the Kitsap’s Terrormedixxx vs Throttle Rockets. Click here for the SCRV site. Click here for the RCRG site.